Milani used to be an excellent brand as far as drugstore nail polish went. They usually had some great seasonal releases that had some special polishes. That all seemed to fade away in the past 2-3 years. I always question what happened, but someone told me recently what happened and now it all makes sense. Gel nail polish happened. Once drugstore brands started releasing gel collections we stopped seeing new nail polish collections in the drugstore. No wonder I was clueless, I never buy gel polish. I guess gel nail polish sells more than unique nail polish. Oh well. I have an older Milani to show you today from one of those cooler fun collections of yesteryear. 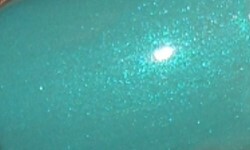 Mint Candy is medium dusty teal with a teal shimmer. Color: I wouldn't really say this is much of a mint color it looks darker and more teal, but I like it anyways. I like the dusty tone of this shade and I think it makes it a great green that fits in winter or spring. The shimmer in this beautiful. I love matching color shimmers to the base. Formula: Formula on this was alright. The formula is a bit thin for my tastes, but it still applied opaquely in 2 coats. It just wasn't as easy to control as I like. Price: You can find this on Amazon in the $3-$4 range. Overall: I like Mint Candy. I think it's a unique take on mint and it's definitely a different an all around beautiful color. I like the shimmer in it, and it really is type of color I don't see often these days.